ca 400 - 300 B.C. 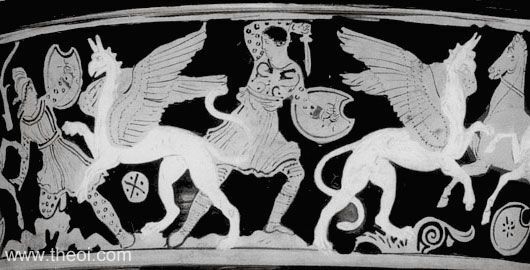 Side A: Arimaspians warriors battle their blood enemies, the half-lion, half-eagle Griffins. The tribesmen wear Scythian body-suits and carry Scythian crescent shields. Side B: Dionysus, Maenads and Satyrs (not shown).